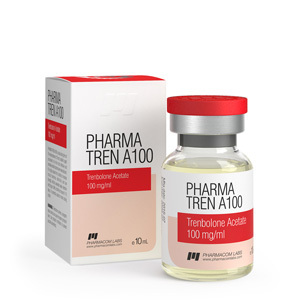 Pharma Tren A100 from Pharmacom Labs is a powerful anabolic steroid with androgenic activity. The main active ingredient is trenbolone acetate. The release form – liquid for pricks in 1 ml ampoules. Pharma Tren A100 PharmaCom Labs is used to actively build muscle in combination with an increase in strength. The chemical formula of acetate differs shortened ester chain, which determines the speed of its action. The positive qualities of the drug also include low ability to aromatize, which reduces the risk of multiple adverse reactions (gynecomastia, fluid accumulation in the tissues and others). elimination of fat deposits by reducing them. they manifest themselves in the form of virilization symptoms, depression of ovarian function, failure of the menstrual cycle in women, as well as in idiopathic hyperpigmentation of the skin, irritation of the urinary tract, gynecomastia, priiasma in men.